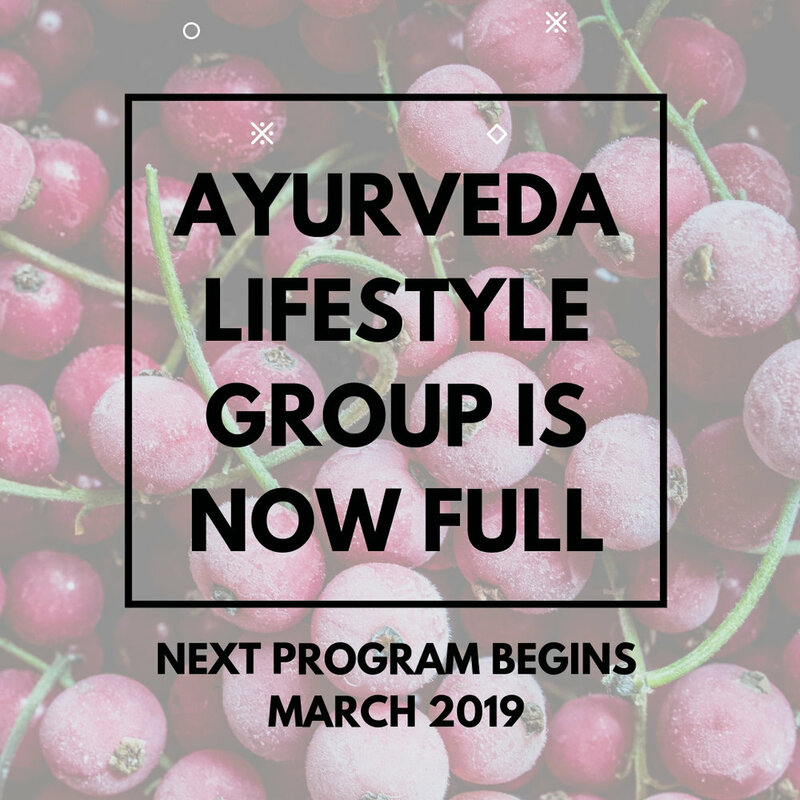 4 month Ayurveda Group Lifestyle Program that focuses on diet and lifestyle therapies, community, and shared experiences through the lens of Ayurveda. Ayurveda is helpful in managing many lifestyle conditions, ranging from mild symptoms to established diseases. Ayurveda advocates for lifestyle modifications to support the bodies' eleven systems, and therefore allows the your body to optimize the healing process. The time to take back your health and wellness is now! Our goal is to increase awareness of the senses in order to pacify physical and emotional symptoms before they manifest into discomfort. Through a community, we can empower ourselves to experiment with the lifestyle practices discussed during group sessions (i.e. Ayurvedic nutrition, herbs, lifestyle therapies, self-care practices, supplements, etc). This information, tools, and practices are available to us all at any given point; however, we will build dialogue around ‘why’, ‘how’ and ‘when’ you apply these practices throughout your every day life to support optimum health and wellness. PART 1: RECEPTIVITY - dipping your toes into new principles, practices, and methods. PART 2: CURIOSITY + ROUTINE - what practices most resonate with you? How can you create a daily routine around the practices that most resonate with you? PART 3: APPLICATION - using your toolbox to benefit your situation and any-given-time through community support and Ayurveda education. Review testimonials from past clients. WORKSHOPS: There will be two. One to kick-off our four months together, and one to close out our time together! We will use this time to give you a base knowledge on Ayurveda, and to further gauge your interests and questions. You will leave this first workshop with the foundations of Ayurveda 101. ONE-ON-ONE CONSULTS: These sessions are meant to clarify the program to meet your needs on an individual level. Each of you will get a toolbox of resources and practices; we will work together to clear any cobwebs and further personalize this process. GROUP SESSIONS: This is where curriculum and education come into play. Each time we meet together, I will offer a lecture on a different modality. Depending on your dosha, the suggestions will be different. You will receive a holistic approach to Ayurveda and how it applies to all; however, everyone will apply these principles differently. When we meet one-on-one, we will specify your program. 30 DAY CHALLENGE: We are kicking off 2019 with a 30-day challenge. All of us. Together. We will keep each other integrated in our experiences through our Facebook group and other social mediums. Monthly Payments Option: $109/month (Oct - Feb) payment due on 30th of each month. Our meeting space: Fireplace Lounge at Versa CoWorking; Tea will be served with each session.